Elsie Ruth Sleeman | Launceston Then! Launceston Mayor Ruth Sleeman with her husband Derrick. Ruth was born in 1930 to Mr. and Mrs. (nee Gregory) Davey at Launceston. She married Derrick Sleeman (b. 1930 at Tavistock) at Launceston in 1953. Ruth started a florist business and for many years up to her retirement, operated out of her shop in Southgate Place. 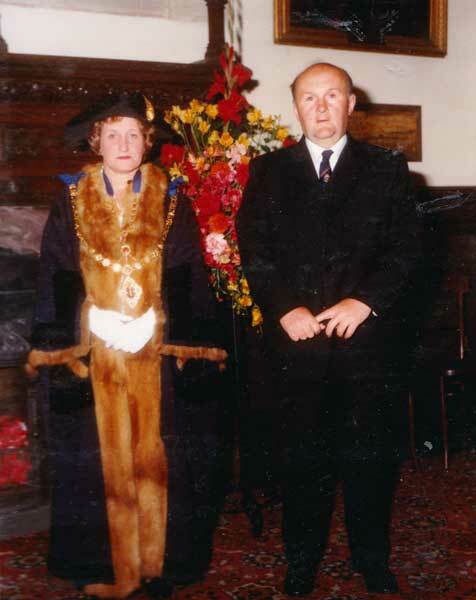 As well as running her business, Ruth found time to sit upon Launceston’s town council, being a councillor for many years eventually being awarded the role of Mayor in the 1980’s. In her later life she suffered from Alzheimer’s, fighting a long battle against the disease until her death at Kernow House, Launceston on January 29, 2009. A Funeral Service was held at St. Mary Magdalene Parish Church, Launceston, on Monday February 2nd at 11am, and was followed by interment at Launceston Cemetery.